The famous publisher, producer and TV show host, Giorgio A. Tsoukalos, says he has some “irrefutable evidence” that an extraterrestrial civilization influenced the American presidential election in order to help Trump win the White House. Mr Tsoukalos was invited on the show L.A. Tonight to discuss various topics, when he made an astonishing declaration concerning the federal election. He said that he’d found some evidence that aliens had used an elaborate “mind-control device” to make Americans vote for Donald Trump. According to him, an unidentified extraterrestrial civilization brainwashed and manipulated the American people by emitting some sort of low-frequency sound wave that enables them to “program the minds of humans”. The controversial host of the TV show Ancient Aliens, explained that aliens had a very complex agenda and they probably have some “very good reasons to want Donald Trump to be elected”. He claims he has evidence to prove his claims and will reveal them to the public in a week or two. L.A. Tonight host, Latifa Johnson, seemed very amused by Mr Tsoukalos’ theories, giggling and laughing throughout most of the interview. 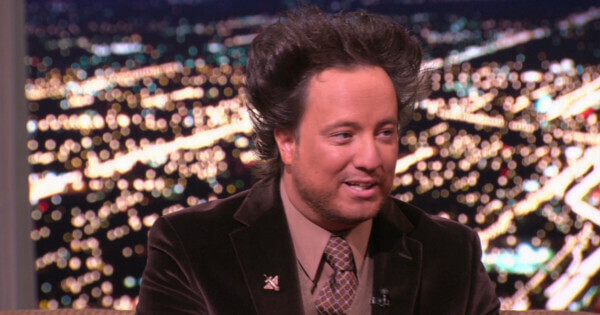 Mr Tsoukalos is well-known for defending the controversial Ancient Astronaut theory, which claims that extraterrestrial life forms have interacted with humans at many different moments in history and shaped many the greatest known civilizations. This is the first time, however, that he makes allegations of alien implication in such a recent event and his claims instantly generated a lot of reactions on the social media. Many people are trying to guess what his “irrefutable evidence” could be and elaborating a lot of strange theories, while others are openly questioning Mr Tsoukalos’ mental health or insulting him.